It seems somewhat ironic that Meissen is named for the smallest river that flows through the town, the Meisa. The mighty Elbe is just as important to the town, as is the smaller, but still bigger Triebisch. 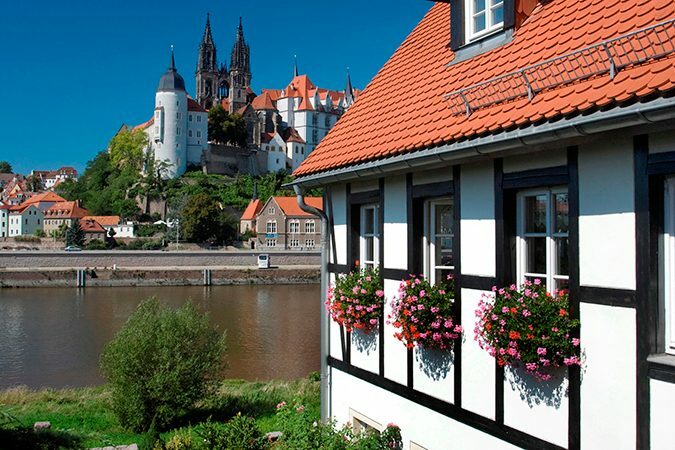 Since in the course of its history Meissen has never been destroyed, it still offers visitors unadulterated romanticism. In the beginning a small castle stood on the imposing castle hill. It was from here that the German colonization of present-day Saxony began. For many centuries the Margraves and later Electors ruled Saxony from Meissen, until Dresden was able to establish itself as the new capital. With Albrechtsburg Castle, a museum today, they built the first “Schloss” in Germany: a castle that served only as a residence and not as a military fortress. After the European porcelain had been invented in Dresden in 1708, a suitable and safe production site had to be found. 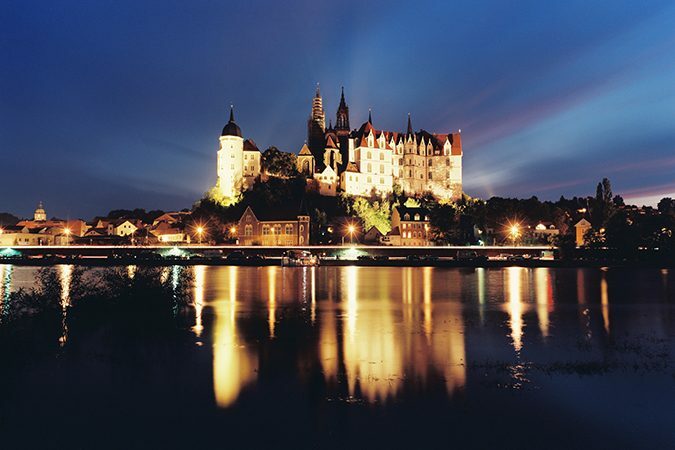 For 150 years, Albrechtsburg Castle served this purpose and the name of the town of Meissen became synonymous with the world’s finest porcelain. Since the latter half of the 19th century, the distinctive products with the Crossed Blue Swords, the longest-serving trademark in the world, have been made in a new manufactory on the Triebisch River. Every year, visitors from all over the world visit the workshops, the museum and the outlet store and the town which gave the porcelain its good name. 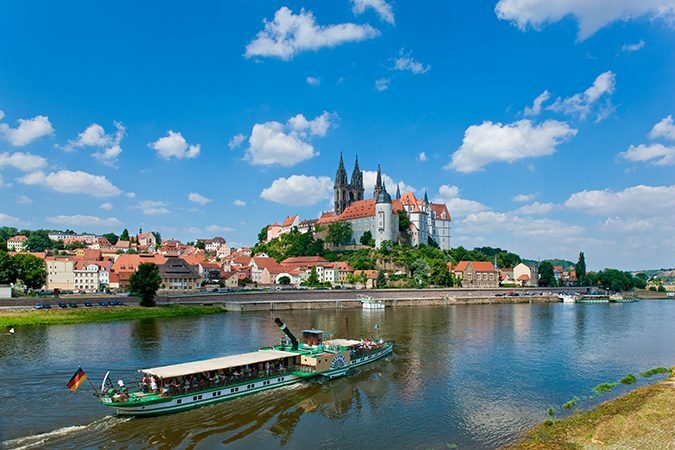 Meissen is the centre of the Saxon wine-growing region along the Elbe River. Around Meissen, wine has been made for 850 years. With a view of Meissen, Prince zur Lippe makes the best wine in Saxony. Smaller vineyards are spread out around the little villages nearby. And Vincenz Richter’s wine restaurant on Meissen’s town square is one of the most romantic places in Germany. 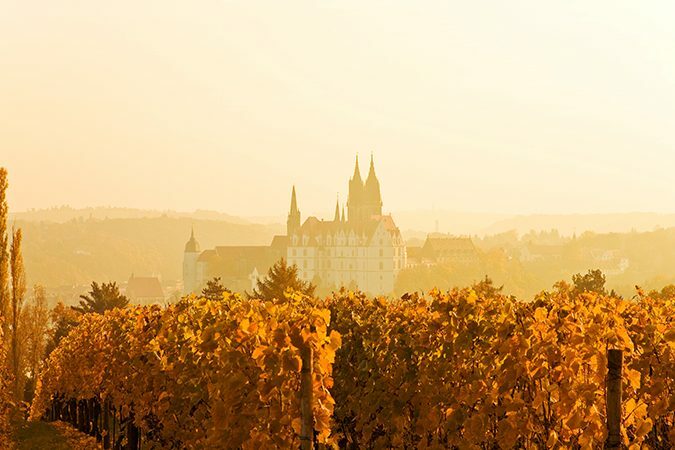 In September, the wine festivals in Meissen and Radebeul attract large numbers of visitors. Not only Meissen Porcelain, but also the ideas of the most famous son of the city have conquered the world: Samuel Hahnemann, the founder of homeopathy, was born in Meissen on April 10, 1755, the third child of a porcelain painter. A plaque commemorates the site of the house where he was born and there is a Hahnemann centre in the ruins of the former Holy Cross Convent. Hahnemann’s house in Torgau is also a centre for homeopathy and can be visited as part of the Torgau Museum Path. Hahnemann also left traces in Leipzig, Dresden and other Saxon towns.